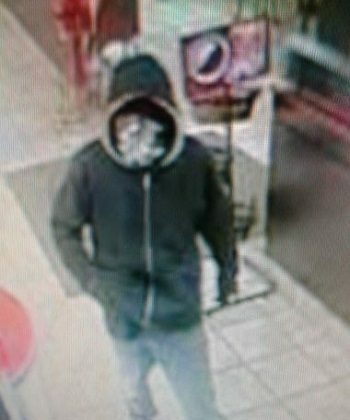 The Nanaimo RCMP are investigating an armed robbery. It happened on Thursday around 11:30 at night at Tim Hortons on Uplands Road, at the North Town Centre Mall. Employees and several witnesses reported seeing a man approach the counter and demand an employee turn over money from the till. He appeared to have a handgun tucked into the waistband of his pants. After an undisclosed amount of cash was handed over, the suspect ran out the front door. Of note was at the same time a black sedan style vehicle was seen circling through the parking lot several times, just prior to the suspect entering the business. But police are not sure if the two events are linked. Officers including Police Dog Services responded but they were not able to locate the suspect. 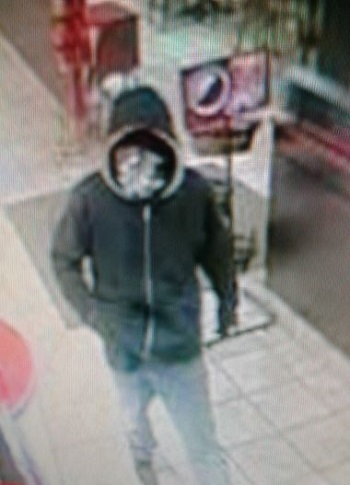 A suspect is described as a white man, about 5 ft. 10 to 6 ft. tall, with a slim build and wearing a mask which concealed the lower half of his face. He was wearing dark clothing including a black hoodie with tan trim, black gloves, baggy pants, and dark skater shoes, with white trim along the base. The picture provided was captured from the CCTV surveillance system. Investigators are trying to locate a higher quality picture.